Based on our experience of working in product management and as heads of product in government, we believe that product management is best ‘learnt by doing’. An important part of our role as heads of product is to create the best possible opportunities and environment for people working in product management roles to be successful and deliver valuable outcomes for users. Product managers are responsible for the quality of their products, and they use their knowledge of user needs and business goals to frame problems and set priorities for their delivery teams. But we have spotted a gap. No one in the wider product management industry seems to have figured out exactly what product managers need to do, in order to learn and develop. So we've had a go at defining version one of this list of things you need to do to learn the product management craft, and to develop from an associate product manager to product manager. Associate product managers are the people who are starting out on their product management careers and learning the skills of their craft. We want to support our associate product managers to become the product leaders of the future. Being a successful product manager means balancing a wide range of activities with maintaining a relentless focus on delivering valuable outcomes for users. Successfully achieving this balance is the essence of the product management role and it is challenging. What exactly should product managers learn to progress in their career? We have attempted to define this for the associate product managers working in government. Based on the role description and skills described in the Digital, Data and Technology (DDaT) Capability Framework, the list of activities and experiences helps associate product managers – and their line managers – to take greater ownership over their personal development, and gives practical examples of the things we expect a successful product manager to be able to do. This list of activities and experiences in the DDaT Capability Framework is part of our vision for an Associate Product Manager Development Programme. All supported by a strong community of fellow associate product managers in the programme cohort, alumni, and the wider Product Community. This list of activities and experiences is not intended to be prescriptive, or a test of ability. It is intended to be a guiding framework to support associate product managers to become the best #ProductPeople that they can be and to deliver the most valuable outcomes for their users. This list is just a starting point. We’d love to continue this conversation and hear what you think is missing. You can comment below, or on GitHub, or follow and message us on Twitter @JPForman86 and @ScottColfer. 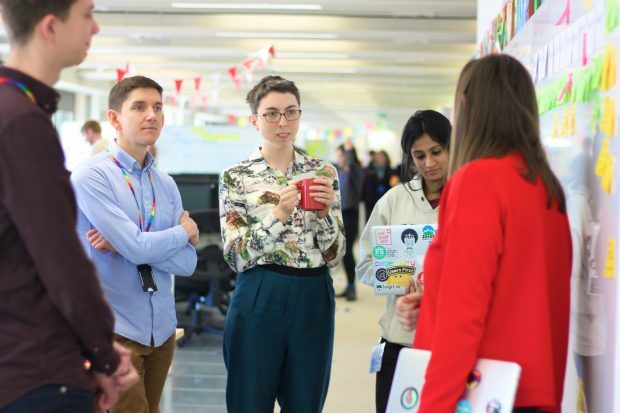 If you’re interested in a career in product management in government, come and talk to some of our product managers at Silicon Milkroundabout on 27 April (Product Day) on stand 106/107. GDS are hiring. Apply if you think you’ve got what it takes to work as an associate product manager in government. For more job opportunities follow @digicareersgov.